(CNN) -- To many, the spur-booted buckaroo in the ten-gallon hat may represent a time gone by. But the American cowboy is still alive and well -- and it's not too late to join his (or her) rangeland ranks. Hit town for the National Day of the Cowboy on the fourth weekend in July and you'll be in for a treat. As you might expect, the town puts on a hell of a hootenanny. If you want to be less of a dude and more of a dust-kicking cowpoke, consider the 87,000-acre Chico Basin Ranch. Located 35 miles outside of Colorado Springs, Colorado, Chico Basin is a true working ranch where guests perform every task that experienced cowboys must do in order to keep the ranch functioning. That includes repairing trucks, equipment and fences; constructing gear in the leather shop; and branding and moving cattle. Most of the work is done on horseback. Chico doesn't offer many comforts, so guests get the true working cowboy experience. But if visitors need a relaxing activity after a hard day's work, they're welcome to go fishing on one of the ranch's five lakes. At Colorado's Zapata Ranch, guests herd bison as well as cattle. Like Chico Basin, Zapata Ranch in Mosca, Colorado, is owned by The Nature Conservancy, but it's run by the state ranch management company Ranchlands, so there's a strong emphasis on sustaining one of the most ecologically diverse regions in America. The ranch itself stretches through forests, wetlands, sand dunes and verdant pastures. All visitors get a hands-on cowboy experience, not only moving cows, but also herding about 2,000 buffalo from pasture to pasture to help sustain the land. Guests also fix barbed wire fencing, tend to giant center-pivot irrigation sprinklers, and learn how modern practices are being fused with classic cowboy traditions to help preserve one of America's greatest assets. Since the 1980s, more and more cowboys have been adopting Natural Horsemanship practices, made famous by the film "The Horse Whisperer." At McGinnis Meadows in Libby, Montana, horse lovers learn the practices championed by Buck Brannaman. The method works with the natural instincts of the animal, building trust and mutual respect. After learning how to "whisper," you and your horse will track, pen and drive cattle. 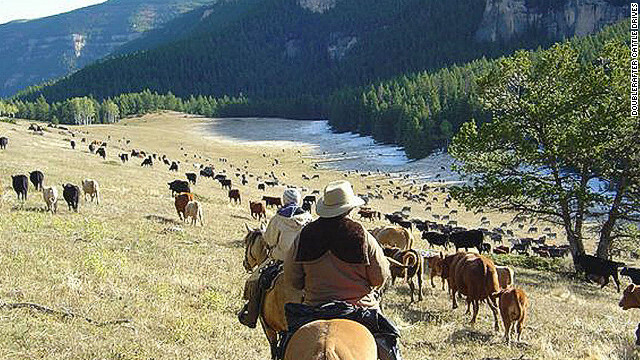 Legit nomads can ditch the working ranch routine for a real deal cattle drive. For six days, you can ride through the mountainous rangeland of Wyoming, moving cattle to greener pastures through terrain too rough and restrictive for anything with wheels. Each night you'll set up 1800s-style canvas wall tents, eat grub cooked in a Dutch oven and entertain each other by the campfire. The professionals warn guests to expect the unexpected -- from brush fires to stampedes to impromptu rodeos. After nearly a week in the saddle you'll be ready for a steady seat. And you can enjoy one at the famous cowboy saloon, The Mint Bar, in Sheridan, Wyoming, where most groups spend their last night. In the time it takes to read this sentence, you've left the gate at Let R Buck and been thrown off your first bull. Working the rangeland can be as gratifying as it is grueling, but for some bronc busters, nothing compares to the adrenaline rush of riding a 2,000-pound beast for eight never-ending seconds of glory. At Let R Buck bull riding school in North Canaan, Connecticut, you can learn about the mighty bull, its body language and how to stay on it for about the same amount of time it takes to read this sentence. After six days of classes, you're ready to ride at a professional rodeo.